Saint Augustine (354-430) is one of the most influential thinkers of the Western World. His answers to life’s profound questions shaped Western civilization to an unparalleled degree. How did the Middle Ages come to know this great Father of the Church? How did his large oeuvre survive the nearly sixteen centuries since his death? This is the ninth in a series that looks over the shoulder of medieval readers to discover how they shaped Augustine’s legacy, and created an image of the man that has endured to our times. Having taken a longer pause in between articles, I would like to take the opportunity to insert a column in the series that approaches the topic of ‘Augustine in the Middle Ages’ from a slightly different angle than we’ve pursued thus far. Staying mostly within a chronological framework, we’ve traced Augustine’s works from their birthplace in North Africa through Italy, Southern Gaul, and Anglo-Saxon England all the way to the Carolingian empire. Each stop on this centuries-long journey highlighted the, often remarkable, achievements of the medieval scholars, scribes, and compilers who preserved but also changed – wittingly or unwittingly – Augustine’s writings and how they were read. Every step is important, every reader a potential filter who slightly alters the lens through which we view Augustine today. However, the ‘Augustine’ known to the Middle Ages is also an artificial construction, made up of facts and fictions about Augustine that, for some reason or other, appealed in particular to medieval audiences and, by the repeated emphasis they received, gained greater importance than they may have had originally. Of course, while the pierced heart as a symbol of Augustine’s conversion and subsequent love for God has a basis in his writings, there are also stories, miracles, legends associated with Augustine that have no relation whatsoever to anything he wrote or preached. These legends contributed to the aura surrounding Augustine and though they fall in a different category than the medieval scholarship on his authentic writings, we must not overlook them when trying to paint a picture of how Augustine made it through the Middle Ages. Today, we will recount one of the most charming stories about Augustine. It had its origins in the later Middle Ages and became a part of the lore surrounding ‘Saint Augustine’, depicted several times in the art of the later Middle Ages and Early Modern period. While Augustine was working on his book On the Trinity, he was walking by the seaside one day, meditating on the difficult problem of how God could be three Persons at once. He came upon a little child. The child had dug a little hole in the sand, and with a small spoon or seashell was scooping water from the sea into the small hole. Augustine watched him for a while and finally asked the child what he was doing. The child answered that he would scoop all the water from the sea and pour it into the little hole in the sand. ‘What?’ Augustine said. ‘That is impossible. Obviously, the sea is too large and the hole too small.’ ‘Indeed,’ said the child, ‘but I will sooner draw all the water from the sea and empty it into this hole than you will succeed in penetrating the mystery of the Holy Trinity with your limited understanding.’ Augustine turned away in amazement and when he looked back the child had disappeared. Though the story is depicted several times in late medieval and early modern art, its origins are sketchy. A written account is found in an English translation of the so-called Legenda Aurea or ‘Golden Legend’. This was a collection of saints’ lives put together by an Italian Dominican named Jacobus De Voragine around the middle of the thirteenth century. The work is filled to the brim with stories and legends that De Voragine sourced from a wide variety of earlier medieval literature. It is the most comprehensive collection of medieval lore on saints we have and an important reference for identifying saints by their attributes. The work was incredibly popular, with hundreds upon hundreds of manuscript copies still surviving today. The ‘Golden Legend’ was probably aimed first at preachers, who could find in the work inspirational stories with which to embellish and round out their sermons. William Caxton’s version of The Golden Legend. Jacobus was quite well-informed about Augustine’s life, referring repeatedly to information provided by Augustine himself in the Confessions – his misspent youth, his being baptized by Ambrose, the Tolle lege scene, and Augustine’s subsequent important contributions to Christian doctrine. Given the work’s popularity, it is not surprising that vernacular translations were made. One of these was published by William Caxton, the famous English printer, in 1483. It is in this English translation that the story of the child is added to Jacobus’ account of Augustine’s life. The translator mentions he saw it depicted on ‘an altar of S. Austin at the black friars at Antwerp, howbeit I find it not in the legend, mine exemplar, neither in English, French, ne in Latin’. One of the earliest visual representations of the story of Augustine and the child by the seaside is found in the church of Saint Augustine in San Gimignano, today one of the most popular-to-tourists towns in Tuscany. The church boasts a series of frescoes depicting the life of Saint Augustine, painted by Benozzo Gozzoli (1420-1497), a pupil of Fra Angelico (1387-1455). The twelfth scene in the series depicts our medieval legend about Augustine. It is the image at the top of this article. 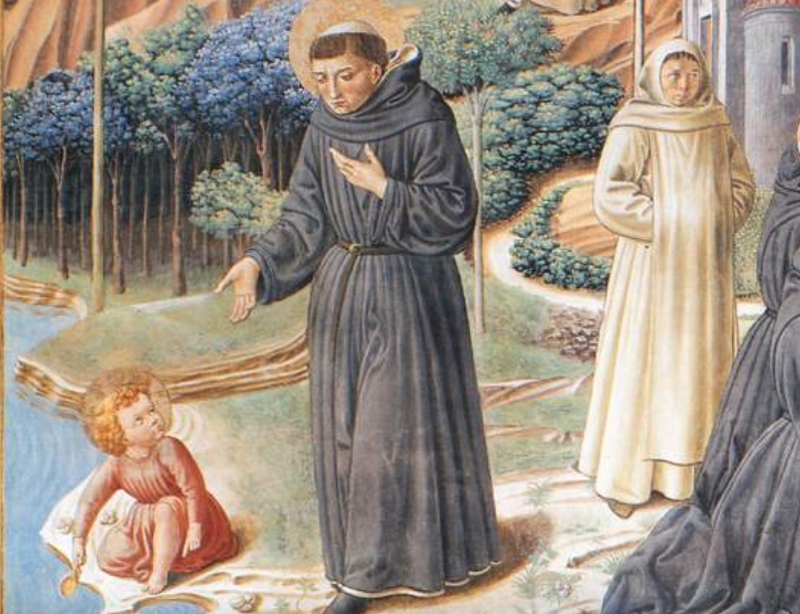 In the lower left-hand corner, we see Augustine speaking to the child. The artist hinted subtly at the subject of their conversation, the Trinity, by surrounding the child with three seashells. This late medieval legend about Augustine meeting the child – which represents either Jesus or an angel, depending on the version of the story – simultaneously shows the humility that Augustine expresses in his writings and sermons, when he thinks about and discusses the most difficult theological issues, and the authority with which the Middle Ages imbued him as a Father of the Church – after all, not just anyone receives divine advice. Further reading: J. C. Schnaubelt, F. Van Fleteren (eds), Augustine in Iconography. History and Legend, New York, 1999. If you are interested in browsing through the Legenda Aurea in the Middle-English translation published by William Caxton, you can access it here: https://sourcebooks.fordham.edu/basis/goldenlegend/. Next month we will pick up where we left off. On the next leg of our journey we will encounter the man who wrote the standard textbook of theology for the Middle Ages.